Go for a jaunt from George Town to Teluk Bahang to see ESCAPE about 36 minutes away. Spend the 7th (Mon) exploring nature at Penang National Park (Taman Negara Pulau Pinang). 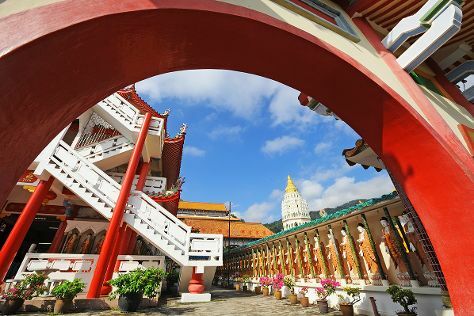 And it doesn't end there: contemplate in the serene atmosphere at Kek Lok Si Temple, take in nature's colorful creations at Tropical Spice Garden, examine the collection at The Camera Museum, and take a stroll through Armenian Street. To see where to stay, ratings, traveler tips, and more tourist information, read our George Town trip planner. Austin, USA to George Town is an approximately 28-hour flight. You can also do a combination of flight and ferry; or do a combination of bus, tram, and flight. The time zone difference moving from Central Standard Time to West Indonesia Time is 13 hours. Traveling from Austin in January, things will get warmer in George Town: highs are around 36°C and lows about 28°C. Cap off your sightseeing on the 9th (Wed) early enough to travel back home.